I’ve been doing a lot of rug searching over the last few days because my new house will be having concrete floors. I am beyond excited about this. This new move is allowing me for the first time to really do what I want with my home. We’ve always rented and we were those good tenants that followed the rules about not painting…blah blah. With that being said, I’ve lived with peachy walls for the last three years and I just can’t contain my excitement of moving into my new grey walled home!!! 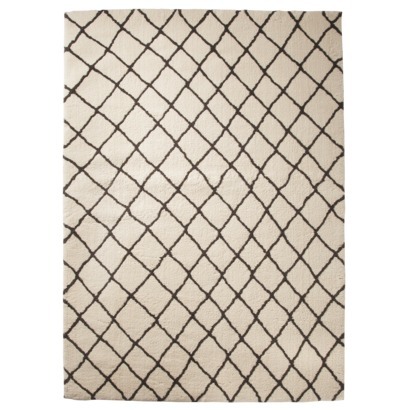 This is the Tuscan Moroccan Shag from Rugs USA…I love this site. I’ve ordered from them before and they always have the best deals. Again…this one would be close to $1,000. It is currently out of stock anyway, but I really like the diamond pattern. at none other then Target! This Threshold Criss Cross Fleece rug may just have to be purchased. This rug in the 7×10 is only $250!!! Did I just lose you, are you shopping at Target for it at this moment…I would be! So…splurge vs. thrifty…which is your way? Such an awesome price! I love it!